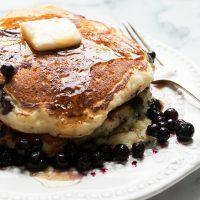 Classic, thick, blueberry pancakes that are always perfect. Be sure to cook over medium-low heat (low and slow). You can use fresh or frozen blueberries. Melt the butter, if using, and allow to cool slightly. In a large bowl, whisk together the flour, baking powder, salt and sugar. In a small bowl, whisk together the egg and milk. Do not combine the two until your pan is hot and ready to go. Heat your pan for several minutes over medium-low heat. When you're ready to cook, Make a well in the centre of the flour mixture. Pour the milk mixture into the well, then add the melted butter and vanilla. Quickly stir together just until mixed and batter is still lumpy. Add a bit of butter or cooking oil to the pan and swirl around. Add batter in 1/4-1/3 cupfuls to hot pan or griddle. After a few seconds, spread batter out slightly and sprinkle top with blueberries. Allow to cook over medium-low heat until the underside is golden, then flip and continue cooking until batter is cooked through. Will make 5-6 large pancakes. *To make soured milk, remove 1 Tbsp of measured milk and replace with 1 Tbsp lemon juice. Stir and let stand 5-10 minutes.